William Phillips Handsigned and Numbered Limited Edition Giclée Canvas:"Dauntless Against a Rising Sun"
Edition: 100 Artist Signed and Numbered Limited Edition Giclée Canvas editions. About the Art: It's June 4, 1942. 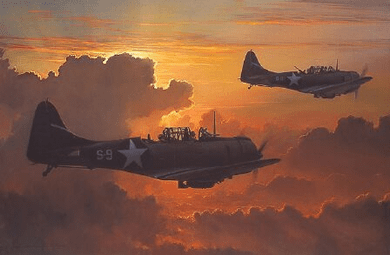 Two U.S. Navy SBD dive-bombers - "Dauntlesses" from the carrier Yorktown - climb into the pacific sunrise and head toward the island of Midway, now threatened by Japan. Since the attack on Pearl Harbor, six months have passed in dark clouds of defeat. Japanese forces control the Pacific, their rising sun ignites the Orient. But today the tide will turn. The Dauntlesses will howl out of the dawn to smash a huge Japanese armada. This battle of Midway was history's second naval encounter fought entirely by aircraft. (The first was Coral Sea.) American losses were heavy: 132 planes down, and one carrier sunk - the Yorktown. But the SBDs sank four enemy carriers, and with them, 275 planes. Thanks to Dauntless planes and dauntless men, the darkness of defeat gave way to a dawning of hope for final victory.